You know those unsuspecting bottles of clear vinegar hogging all the space on the grocery store shelf? Yeah, that’s distilled white vinegar and you should be hoarding it in your pantry. Distilled white vinegar is made by feeding oxygen to a vodka-like grain alcohol, causing bacteria to grow and acetic acid to form. It’s those acids that give vinegar its sour taste. Vinegar can be made from any alcohol—wine, cider, beer—but it’s grain alcohol that gives distilled white vinegar its neutral profile. This vinegar tastes more assertive than most, but it contains roughly 5 percent acetic acid (about the same amount as other vinegars you use for cooking), making it perfectly safe to eat. 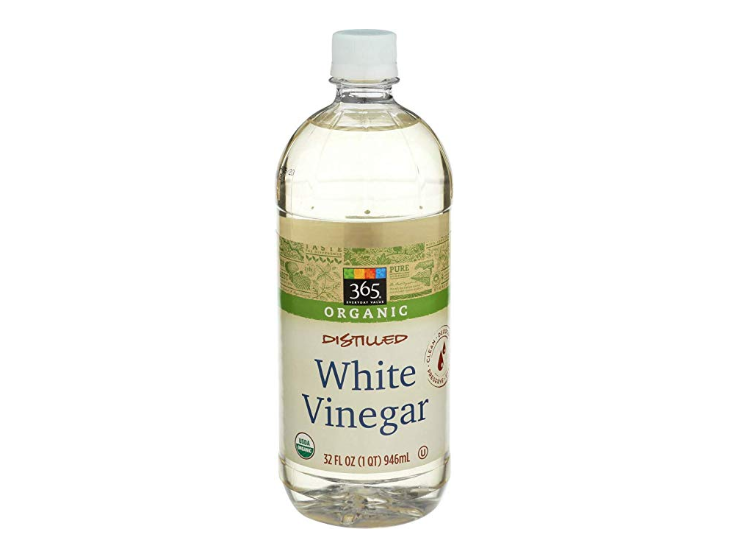 Now, don’t confuse it with basic white vinegar, which is stronger and has up to 25 percent acetic acid. That vinegar is sold exclusively for cleaning purposes and not a good idea for you to ingest. However, beyond cooking, distilled white vinegar can be used for many of the same household chores. It might be a little unnerving that the same ingredient can be used to clean your shower head and liven up a barbecue sauce, but it is inexpensive to buy, good for the environment and incredibly versatile. If you need further convincing, here are 15 ways to put that gallon-size jug of vinegar to use, both in your cooking and around the house. 1. Poaching Eggs: Add a splash to simmering water. It helps the egg whites set and gives you a more uniform poached egg. 2. Pickling: Distilled white vinegar’s neutral flavor and color and won’t affect the color of your pickles or detract from the herbs and spices you’re using. Also, considering its approachable price tag, it’s also great if you’re pickling in big batches. 3. Baking: Add a teaspoon or two to cakes, cupcakes or cookies to react with the baking soda. This is especially great in egg-free desserts. 4. Cooking Rice: Add a teaspoon of vinegar to your rice cooking water. This will give you less starchy, fluffier grains. 5. Buttermilk in a Pinch: If you need buttermilk for a recipe, but are fresh out, add 1 tablespoon of vinegar to 1 cup of whole milk. Let sit for 5 to 10 minutes before using. 6. Marinades and Dressings: Use like any other vinegar to balance out sweetness, or enhance the saltiness without adding more salt. When used in marinades, it also helps tenderize meat. Distilled white vinegar is best in sauces with a lot of sugar (like barbecue sauce), or dressings with a lot of strong herbs and competing ingredients (think chimichurri). 7. Royal Icing: A teaspoon of vinegar in your royal icing balances out the sweetness, and helps it set faster. The acid stabilizes the egg whites, so it’s a good substitute if you don’t have cream of tartar. This is especially helpful when making a gingerbread house. 1. All-Purpose Cleaning Solution: In a spray bottle, combine 1 cup of distilled white vinegar with 3 cups of water and use on everything. This solution is good for streak-free windows, stove-tops, tiles and more. Double check before using on your wood floors. Also, if you have a pet, use this mixture to spot clean your carpeting—the vinegar sanitizes and covers up the smell of urine so your dog or cat isn’t tempted to revisit the same area. Don’t love the smell of vinegar? Let vinegar sit in a jar with strips of lemon zest and thyme for a week or two in a sunny spot, then strain. Mix with water as described above. This can be done with any herb or fragrant plant like lavender or eucalyptus, just avoid anything that colors the vinegar if you plan on using it on a white carpet. 2. Relieve Sunburn Pain: Soak a washcloth in a 50/50 solution of distilled white vinegar and water and dab on your sunburn, or add 2 cups to your bathwater. 4. Fresh Flowers: Add a few tablespoons of vinegar to your flower water to make your flowers last longer. When the water gets cloudy, dump it out and repeat. 5. Clean Your Microwave: To get rid of any smells or cooked on food, in a microwave safe cup combine ¼ cup of distilled white vinegar and 1 cup of water. Microwave on high until the mixture comes to a boil and steam forms on the window. Let cool slightly, then wipe away any food residue. 6. Polish Copper, Pewter and Brass: To remove tarnish, in a small bowl combine ½ cup of distilled white vinegar, 1 teaspoon of salt, and enough flour to make a paste. Rub onto the metal and allow it to stand for 15 minutes. Rinse with clean water and polish with soft, dry cloth. 7. Clean a Stinky Sink Drain: To keep kitchen drains fresh, pour 1 cup of distilled white vinegar down the drain once a week. Let it sit for 30 minutes, then rinse with cold water. Butcher block countertops are hard to clean because it’s not like you can toss them in your sink! Scrub the wood with straight distilled white vinegar to sanitize and freshen (this would also be a great use for that scented vinegar).